It is time for changing two or three older pieces of work that haven’t sold. I am happy to say that overpainting previously painted and steamed silk can give some very pleasing results. Here a (boring) pale cream, lilac and blue combination is transformed. Firstly with a new set of motifs applied. Then painting in with another range of colours, this time greens and bronze. Gradually the whole square is transformed. It is a creative process that generates some intriguing overlapping combinations of colours. It was this . . . . .
and then this (ready for steaming) . . . .
For sale here – Update 2019 now sold. Valentine’s Day – Red, pink or maybe . . . ? It’s just under two weeks’ to Valentine’s Day. Naturally, there’s plenty of red merchandise filling the shops, but I’ve noticed there’s more choice than ever and if red Valentine’s cards, red flowers, red boxes of chocolates, and so on, are perhaps too traditional, you can now find similar in pink. Currently, I do have several predominantly pink silk scarves listed on my online shop. However, perhaps a combination mixing it up – pink with accents of deep red is less obvious and slightly more memorable?? Mind you choosing a scarf that is not overtly considered the traditional Valentine’s ‘colours’, say, grey (altogether more muted with the merest hint of pink), could be just the ticket! Author agnesashePosted on February 2, 2017 February 2, 2017 Categories Scarves, SilkTags grey silk, handpainted, model, pink, pink scarf, red, red scarf, silk, silk scarf, Valentine's, Valentine's Day, wearable art2 Comments on Valentine’s Day – Red, pink or maybe . . . ? Proper old-fashioned sale for 5 days on my online shop. Over half of my work is now 20% off and a few pieces are over 50% off for the next five days. And, delivery is included in the sale price! Last October three metres of crepe de chine arrived to be painted for a blouse. Three metres will take me about two weeks to complete, but before I begin such a project I take the opportunity to make some samples and often a scarf to establish that I’ve interpreted the brief as expected. Here are a few photographs as the work progressed. The finished scarf after steaming showing the colours just that little bit brighter. 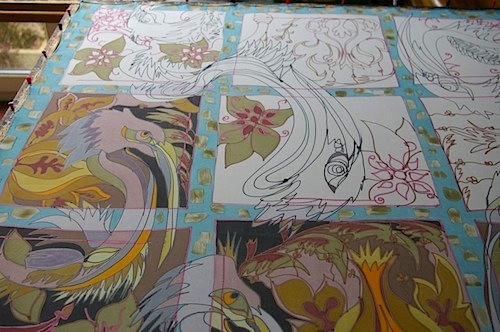 And, half way through the three metres of crepe de chine – last autumn. Fast-forward to February 2016 and the silk has been made up. I’m always thrilled to see my work transformed into garments. 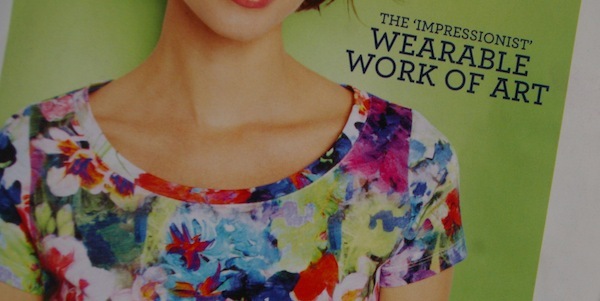 Do we think painterly florals are ‘Wearable Art’? Last week a mid-market catalogue arrived in the post with this cover page. Now the expression ‘Wearable Art’ is extremely flexible and let’s be honest a bit naff. Not for one minute am I saying that some art isn’t so beautiful you want more of it, for yourself, to remind you of seeing it. Most major art galleries and museums now have ‘the shop’ where you can buy all kinds of items emblazoned with reproductions of traditional, formal art. I have to admit to being so enamoured of Van Gogh’s ‘Sunflowers’ that I made myself a sunflowers silk top, but I never thought I was wearing his art. Art inspired, yes, but not art. And, that is what I think about the rest of my wearable work, often art inspired, but perhaps not actually art. In the past, I have created art by painting silk where content has been an expression of a concept and knowing that the piece will be mounted and viewed flat on a wall has both broadened and constrained my approach. And, now we return, as so often, to the divide between art and craft where the flexible boundaries are bent by original intent. As this year’s spring/summer fashion hits the stores, apparently one of the major trends in both fashion and interiors is ‘painterly florals’. I suppose this will be clothes made from floral textiles where the printed fabric designs were originally painted flowers with visible brushstrokes. I’m guessing it doesn’t mean cloth directly painted with flowers! Shame – as that would be such a boon to us silk painters who often actually paint flowers, sometimes called art, sometimes wearable, but always one-off images. Work in progress – painterly flowers, birds and urns. Author agnesashePosted on March 18, 2014 December 4, 2015 Categories Flowers, SilkTags art, creative process, fashion, floral, Floral motif, hand painted, painterly florals, Scarf, silk, wearable art10 Comments on Do we think painterly florals are ‘Wearable Art’?